Back up or restore Windows with a single click using System GoBack Free. The release of a new version of Windows is usually exciting and terrifying in equal measure. Windows 10 ramps up the stakes by offering itself as a free update for anyone running Windows 7 and 8. It even provides users with an opportunity to "reserve" their upgrade prior to the OS’s release. The problem is, what if you update and then decide you don’t like Windows 10? How do you get back to the version of Windows you know and love? The obvious answer is to take a fail-safe drive image before you begin, and this is where System GoBack Free comes in. First, download and install the app – it’s a hefty 80MB download, but much of that is taken up with the program's recovery boot image. 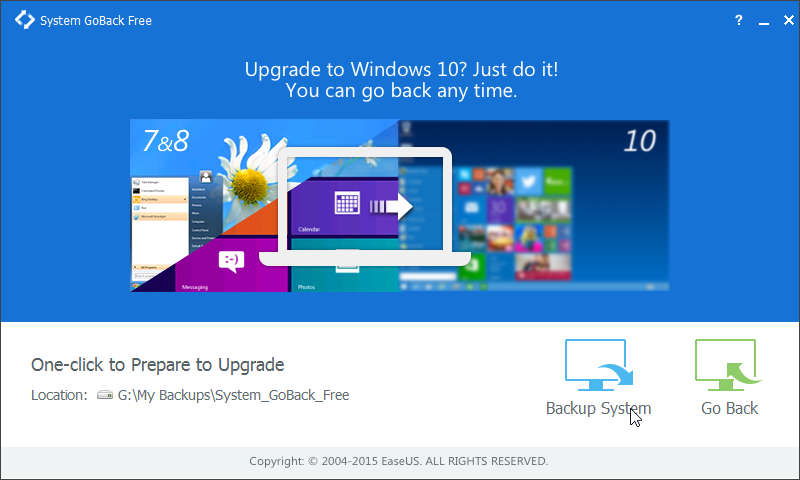 Once launched, you’ll see that System GoBack Free has just two buttons: 'Backup System', for taking your pre-upgrade backup, and 'Go Backup', which you’ll only need to use if you subsequently decide that Windows 10 isn’t for you (or something drastically goes wrong with the update process). Take a note of the Location path – this is where System GoBack Free will save your fail-safe image. Sadly, you can’t change this. It’s simple to use, but the failure to automatically create an emergency boot disc leaves the user dangerously exposed should the upgrade go horribly wrong. Hello I have downloaded EaseUS System GoBack Free 1.0 and used it to make a back up before going to win 10, I have had to many problems with programs I have and wanted to go back to win 8.1. I used the EaseUS System GoBack to er "go back" and after following the prompts to re boot to start the process the PC came back with a message loading files please wait and that was hours ago with the only signs of life is the now 2 flashing green led's of Scroll lock and Caps lock...Now what?